Here is Niagara Falls in Winter, Coraline! I stumbled upon your site a few months ago, but have been back a few times to look at the great pictures - maybe we will go to Canada for a holiday one of these days! It looks really nice and there is so much to do and see - we want to go to Niagara Falls - is it really as beautiful as it looks? 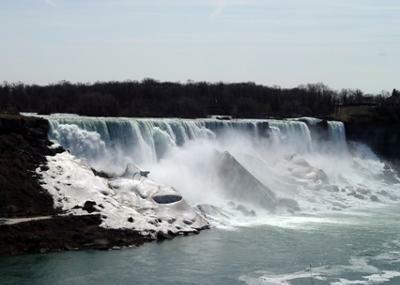 Thank you for your comments, I hope you come and visit Canada some day - and yes, Niagara Falls is lovely at any time of the year, I have put a picture of the Falls in Winter here. Comments for Greetings from Australia! Ontario is beautiful in all four seasons, though the ice and snow can make winter travel less dependable. You would probably be most impressed by the autumn colours that come forth from the maple trees around the end of September. We live in the area of Kitchener-Waterloo, which is west of Toronto.